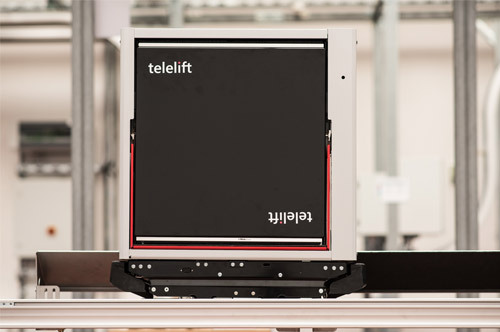 Telelift GmbH has been a household name in machine and system construction since it was founded in 1964. 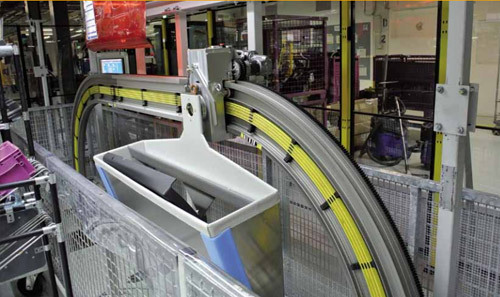 We rank among the leading manufacturers of conveyor systems for transporting light goods in-house. Approximately 100 employees now work at our site in Maisach, Germany. The company is certified in accordance with DIN EN ISO 9001:2008. MultiCar is the "big brother" of the UniCar and transports goods of higher payloads. Its low construction height allows for space-saving installation solutions. The system transports horizontally, vertically, and horizontally overhead. The vehicles are equipped with forward and rear drive. The technology is configured for simple and complex industrial applications. It is popular in modern libraries and hospitals thanks to its low-noise operation. UniSortCar is the newest system in the Telelift product family. It was primarily designed for use in modern libraries. UniSortCar makes itself useful as a system for transporting individual books. At the same time, it can be used as a sorting system from the automated book drop-off station to the open access and repository areas. Using this transport system saves time and increases the books’ availability to the users. Internal logistics in hospitals depends on quick and dependable transport between individual wards. 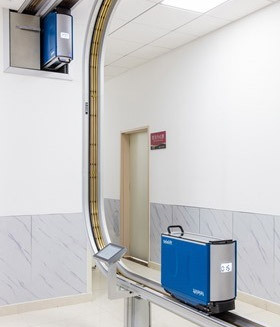 Typical transport goods which can be conveyed with UniCar systems include blood and laboratory samples, results, instruments, sterile goods, medications, and stored blood. The safe and hygienically flawless transport of these goods is especially important, since it makes a decisive contribution to patient safety. 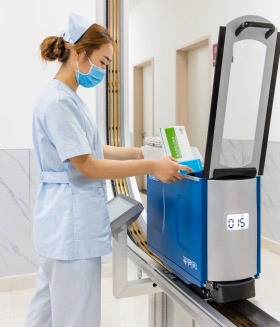 The use of a UniCar system improves material flows, supports hospital logistics, reduces costs, and frees up nursing staff from tasks which are not part of their profession. 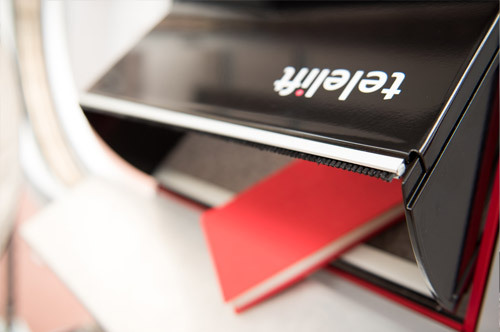 Our fully automated book transport systems serve as a quick connection between the repositories, open-access areas, drop-off, check-out, and reading rooms. Telelift offers individually adjustable systems – for collective and individual book transports alike. They can additionally be equipped with an automated loading and unloading function. Telelift systems are economical and save time. They free up library staff and increase the availability of the book inventory for the users. Banks, insurance companies, production facilities, government agencies, and administrations with high security status are confronted with the task of how to transport sensitive internal documents, data media, and valuables spontaneously, promptly, and safely. Banks, air cargo centers and offices with high security needs face an additional requirement whereby any risk of potential tampering during transport must be absolutely eliminated. Telelift systems are the ideal partners to handle all pickup and delivery services when it comes to valuables and confidential documents. The electromechanical safety locking in the container protects the cargo from unauthorized access. Every transport is monitored and documented without exception. Automated rail transport systems offer solutions for all logistics applications in the field of small goods. 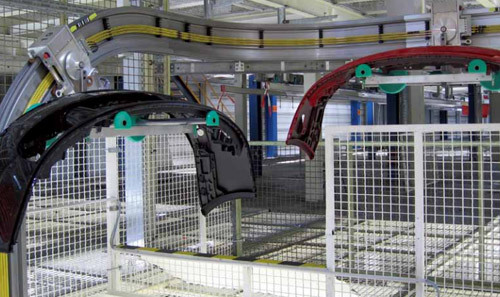 They connect production areas with one another and link workplaces – or even several building complexes. This saves floor area for use as production and work space. In-house transport systems are economical and reliable. Our transport systems are easy to adapt to changing requirements – no matter whether the object is to achieve greater automation, a new kind of goods to be conveyed, or higher capacities.